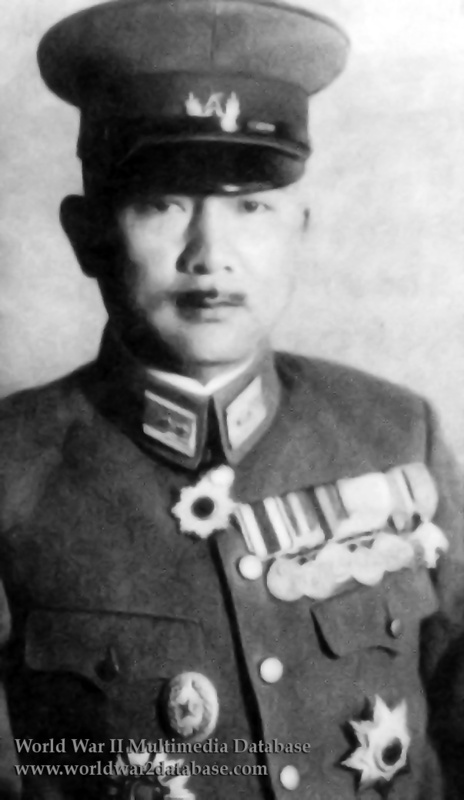 General Tadamichi Kuribayashi (July 7, 1891 - March 23, 1945) was ordered to directly command the Imperial Japanese Army's 109th Division, and overall command of the Ogasawara Army Group, which included Iwo Jima and Chichi Jima. A descendant of the Samurai of Nagano prefecture, he traveled extensively in the United States while posted to Washington, D. C. as deputy military attache. In May 1944 he was commanding the Imperial Guards Division in Tokyo when he was personally charged with the defense of Iwo Jima. Despite his reservations, he took command on June 8, informing his wife and family to not expect his return. His policy of defense-in-depth from pillboxes and tunnels did not meet with the approval of his officers, and he dismissed eighteen officers, including his Chief-of-Staff. He could not control the Naval troops under his command, and they dug in on the beach. His men dug 13,000 yards of tunnels, including a field hospital. Without hope of air support or naval relief, he knew his 21,000 men were doomed. He exhorted them to inflict maximum casualties, to kill ten men before dying. The Iwo Jima garrison held out for 33 days. On March 10, Kuribayashi reported to Tokyoi, "Although the attacks of the enemy against our Northern districts are continuing day and night, our troops are still fighting bravely and holding their positions thoroughly...200 or 300 American infantrymen with several tanks attacked all day. The enemy's bombardments from one battleship (or cruiser), 11 destroyers, and aircraft are very severe, especially the bombing and machine-gun fire against Divisional Headquarters from 30 fighters and bombers are so fierce that I cannot express nor write here." Kuribayashi committed suicide near the end of the battle, possibly dying while leading the last major counterattack. 1083 Japanese survived; only 216 were captured during major ground combat operations. The rest, starved and alone, hid in the tunnels until the US Army blasted them out weeks or months later.